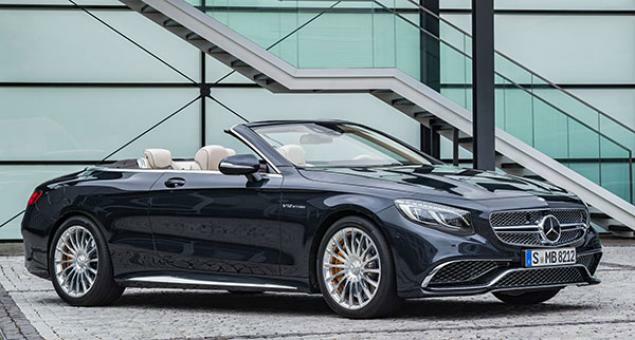 The 2017 S-Class brings two new models, the Mercedes-Benz S650 Cabriolet and the long-wheelbase S550 4MATIC. The 2017 Mercedes-Benz S550 gets a paddle-shifting nine-speed automatic transmission, and all 2017 S-Class models get the mbrace2 Connect infotainment package. The S550 uses a twin-turbocharged 4.7-liter V8 making 449 horsepower and 516 pound-feet of torque. Rear-wheel drive or 4MATIC all-wheel drive is available for sedans, 4MATIC comes on all S550 coupes. Air suspension is standard. The S63 AMG models use a 5.5-liter twin turbo V8 making 577 horsepower and 664 pound-feet of torque with 4MATIC. They will accelerate from zero to sixty in 3.9 seconds. The rear-wheel drive S65 AMG, and the Maybach S650 use a twin-turbo V12 making 621 horsepower and 738 pound-feet of torque. The S600 models have a 523-horsepower V12. Fuel mileage for the popular S550 sedan is an EPA-estimated 18/26 miles per gallon City/Highway, or 21 mpg Combined, not bad for a car this heavy and with this much power. The 4MATIC Coupe drops one mpg. The AMG and V12 models get about 16 to 18 combined. There is an S550e Plug-In Hybrid model that gets an EPA-rated 26 mpg combined. It can go 12 miles on just electric power, using a an 8.7-kilowatt-hour lithium-ion battery pack in the trunk, giving it a rating of 58 MPGe. It’s powered by a turbocharged V6 with an 85-kw electric motor tied to the transmission, making a combined 436 horsepower. It accelerates from zero to sixty in 5.2 seconds.